My husband is perfect. Having said that, know that I am using sort of a loose definition of perfection. Mostly I’m talking about the way that I see my husband and the way that I think of him. It’s true that Nate isn’t actually a perfect person. He has faults and sins, just like me. And just like you. But if I choose to focus on those faults and sins, I’m destined to be unhappy. And since I aim to be the happiest wife, I choose to focus on Nate’s great, amazing qualities. I frequently remind myself and I also remind Nate, that he is perfect…. to me! I married him because I decided that his great qualities far outweighed his negative qualities and that I would love him completely, for who he was, including his faults, and not try to change him. So before I allow myself to dwell on any kind of annoying habit that Nate might have, I instead focus on the fact that Nate loves me and wants me to be happy and he is a good, good person. And he is good to me and treats me like a Princess. That is a perfect dream come true. God brought us together as part of His perfect plan. We were perfectly made for each other. To me…. my husband is perfect! 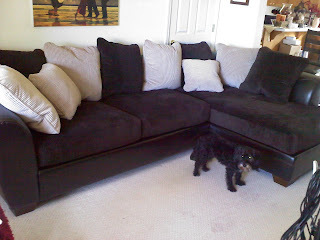 When I married Nate, he had a couch that I considered to be the supreme example of a bachelor couch. 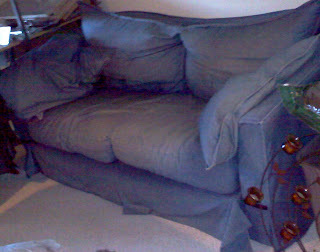 It was a denim love seat that Nate purchased about 13 years ago and it was in horrible shape. I didn’t say much about it but I kindly suggested getting a new couch and Nate thought that was probably a good idea. Before we were even married we had picked out the couch we wanted and requested gift cards for our wedding gifts in order to buy it and Nate didn’t have any problem with that. It was when it came time to get rid of the old couch that Nate started feeling sad. He REALLY wanted to keep it. And he knew that if he suggested that we keep it, that I wouldn’t deny him that and I wouldn’t even put up a fight. But inside I would be bummed to have to have that old couch sitting around. But after thinking about it, he decided that my happiness was more important to him than his couch, no matter how much he loved that couch. So he didn’t say much and he allowed me to get rid of it. I didn’t know the struggle he had inside until after the couch was gone. I felt honored to be loved with such sacrificial love. He wanted me to share this story with you because he wanted my readers to know that he does recognize his part in my happiness. 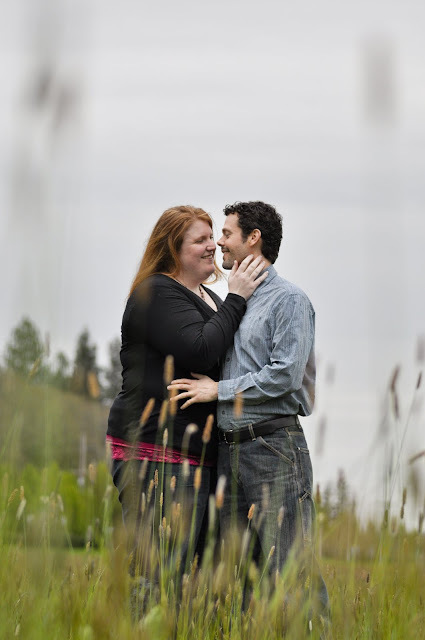 Most of my blogs will focus on what I can do myself to remain the happiest wife, and most of that is maintaining my relationship with Nate and making sure he is the happiest husband, but Nate does know that it really is a two way street. We are confident that if we keep each other happy, we’ll be happier in return. It seems that too many people fall in love with the idea of love, and not as much in love with the actual person that they chose to marry. Then when the infatuation fades and the illusion dissapates, they are stuck with someone they aren’t happy with. They don’t understand what it means to be married. They don’t know how to get their needs met or how to meet their spouse’s needs. Other people get married because they think they found someone who will work out okay for them and they think it may be their last chance to get married. For those who have yet to get married, I plead with you, never think in those terms! Don’t let the thought affect your choice in the least! I have thought like that in the past and I cried to God, asking him why he would let my chance slip by like that. I must have looked so silly to God. He knew there was someone a million times more perfect for me than any of the other loves I wanted so badly in the past. After falling in love with Nate, I thanked God with everything in me for not letting my past desires be fulfilled and helping me to wait for the right one. I’m confident in my marriage and in our ability to stay happy because we see each other for who we really are. And we love what we see. And we desire to meet each other’s needs. We know the impact of not meeting each other’s needs. I’ll blog more specifically about our basic needs in future blogs. Romantic high’s are great, but they don’t last on their own. You must have a sturdier foundation that you can keep building on. And then you have to put in effort to keep romance alive in your marriage. Living in truth and reality and being well rooted in your marriage is the key to mature love. I’ve had a lot of roommates. But that may be the understatement of the year. Yes, I’ve had close to 30 different roommates in my lifetime (not including my family). Some of them have been wonderful people whom I will be friends with for the rest of my life and others made me oh so happy when it was time to move! I’ve learned to live with almost anyone and I can get by just fine. That doesn’t mean I actually enjoy living with just anyone. But I can get along under the same roof with a lot of different kinds of people. But when I chose Nate to be my husband, I didn’t see him as just another roommate opportunity. Believe me, as far as roommates go, he’s a great one! But obviously, he’s much more than that! The problem is that although it seems obvious when you say it like that, in reality, so many husbands and wives end up in a relationship that isn’t much more than roommate status. Because I know that is a very common tendency, I wanted to learn how to avoid becoming roommates instead of lovers. I’m currently reading Kiss Me Like You Mean It by Dr. David Clarke. It’s about having passion in your marriage like the passion between Solomon and his beloved expressed in Song of Solomon in the Bible. There is a lot of great stuff in this book that I will probably share in future blogs. For today, I’ll stick with one idea from the book and that is to make time and talk to each other. Seems like a simple concept. But even after only 6 weeks of marriage, I can see how if you don’t schedule alone time to together the bulk of your conversations will be more informative and purposeful than deep and intimate. It’s easy enough to squeeze in some time to get a run down of the schedule for the week or a list of what you need at the grocery store or maybe, if you have some extra time, you can even squeek in some time to talk about what color you should paint the walls. But the conversations are usually held while you are also doing the dishes and cooking dinner at the same time and your husband is practicing guitar or watering the plants. No eye contact. No connection. Dr. Clarke suggests scheduling time to just sit and talk for 30 minutes at least 4 times a week. They should be spent in a quiet place without distractions (no kids, phones, magazines, etc). And he recommends following his 5 steps to good talk time. I thought they were great steps to follow so I wanted to share them with you! Step 1: Start with a brief prayer. Thank God for each other and invite him to be with you as you spend time together. Step 2: Read your couple’s devotional. Answer the questions at the end. It’s a great conversation starter. Step 3: What’s on your mind? Talk about daily living topics like work, family, and friends. Catch up on life. Look for a topic that might have potential for more intimacy. Step 4: Pray together. Make a list of prayer requests and pray for 5-10 minutes. Hold hands while you pray. Step 5. Move from prayer to conversation. Talk about some of the things that you just lifted up in prayer. These are the concerns of the heart and the things you care about the most. Nate and I have been pretty good about having scheduled alone time most days of the week (it’s a lot easier for us than those with kiddos) but we really want to start praying at the beginning of our alone time. We think that would make our time more meaningful. Try it out! I’d love to know how it goes for you! When Nate and I first met, it was definitely not love at first site. In fact, we had a mutual disinterest in each other. Not that we disliked each other. It’s just that for both of us, the other one didn’t look at all like what we imagined our future spouse might look like. I imagined someone “big boned” with a squishy body, good for squeezing and hugging. Quite the opposite of what Nate’s body type is like. Nate imagined someone more similar to his build, which is very lean. That is not at all how one would describe me. But that didn’t discourage us from becoming friends because we had no limitations in our heads about what our friends should look like. So we did become friends and it wasn’t long before we became best friends. And that lead to lead to love and marriage. We both had a transition time, though, where we had to let go of the pictures in our heads of our future spouses. Once we did that, we were free to see the amazing number of ways that we were a perfect match! Nate is so much more than I ever hoped or prayed for myself. And I had pretty high standards! He gives me more than I expected any husband to ever give. He makes me happier than I ever expected to be. And the amazing thing is that he feels the same way. We are both so thankful that God brought us both to a place where we could look past the barrier that could have kept us from finding our perfect match. We were able to get out of our own way long enough to receive our perfect gift from God. And by the way, even though Nate doesn’t have a big, squishy body, he still gives great hugs! I do not have kitchen skills. I didn’t grow up learning to cook and I haven’t ever really taken the time to practice. But Nate told me when we were dating that he feels super happy whenever I bless him with food related acts of service such as cooking or serving him some food that someone else has cooked. So I knew that when I got married, I could score big points by being in charge of all of our meals. I feel out of my comfort zone. I’ve never really planned ahead for meals before and in the past I always got by with cereal, frozen burritos, and McDonalds. But this just won’t do if I intend to bless Nate with food! So step one was to start making Nate’s lunch for him. This might seem old fashioned to some. But whenever I do it, I get a huge smile and a lunch time text from Nate showing his appreciation. It only takes me 5 minutes and it makes Nate’s day. So why wouldn’t I do it? Step two was to think ahead before I go to the grocery store and to plan out dinners for the week. Right now my dinners are simple. Things like grilled cheese sandwiches or omelets. But Nate says it doesn’t matter if the dinners are fancy. He’s just thrilled to have someone who loves him enough to make him dinner! Step three was to have a plan for dinner and hopefully, have it started when Nate gets home from work so he doesn’t have to think about dinner at all. Step four was to dish up Nate’s plate and to deliver it with a smile and a kiss. Maybe this all seems rudimentary to some of you but this really is something that I’ve had to put effort in to because it’s not something that comes naturally to me. But so far it has really paid off! Nate is so grateful and really appreciates my efforts! I think it might be common for new husbands to feel appreciative of their wives in the beginning and then they forget what it’s like not having a wife to take care them and they lose their feelings of appreciation or they stop showing their appreciation. Have some of you experienced that? I also wonder if it’s common for wives to tire of the effort and they forget to deliver with a smile! I’d love to hear some of your thoughts and experiences! During our first few weeks of marriage, I noticed myself enjoying things that would normally be considered mundane or tedious. For example, the other day I was doing laundry; a task I don’t normally find pleasure in. I had pulled everything out of the dryer except for one wad of clothing. It was a pair of my undies tangled with a pair of Nate’s undies. It made me chuckle and I was happy that our intimates could co-exist and it was good and it was right. I am happy to have someone whom I can share all of the intimate parts of my life with. I hope I never lose appreciation for that, even when I tire of washing undies. I promise to lead you in the ways of the Lord. I promise to live with you in riches and in rags, in sickness and in health, until death separates us. I promise to submit to you in the ways of the Lord. I promise to share my love with you whole-heartedly and exclusively. I promise to stay with you in riches and in rags, in sickness and in health, until death separates us. Some thoughts that Nate and I want to be constantly reminded of are that if Nate is following the Lord and doing his best to lead me down the right path, it will be a lot easier for me to submit to his leadership. I’ll want to because I’ll enjoy the protection and provision that comes along with that. How comforting to snuggle under the protection of his wings! Also, if Nate loves me and lets me feel his love, giving me full acceptance and warmth, I can trust my whole heart with him and not hold any of myself back. My heart can stay soft and giving and loving. These are the things we pray for.